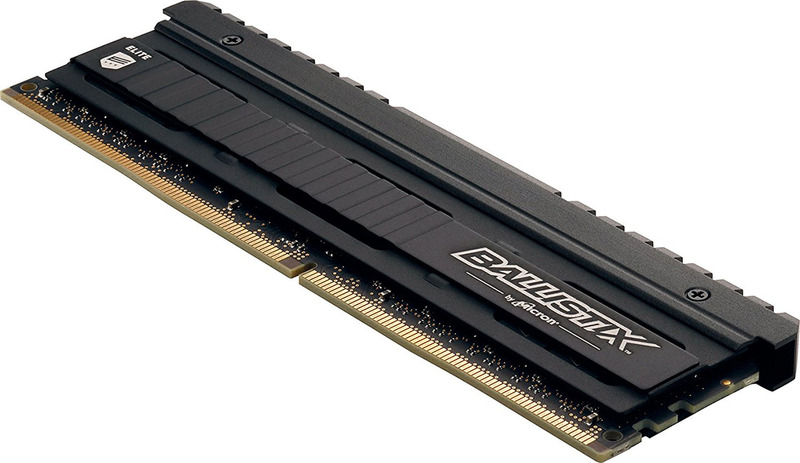 Crucial is upping its enthusiast memory game with renewed focus on the Ballistix Elite line of RAM, which has now been spun-off into its own business unit. Usually one to be conservative, the memory giant now retails heatspreader-clad modules at speeds of up to 3,466MHz. So whilst not in the same frequency league as some, Crucial is no longer inhibited by speeds mandated by the memory standard known as Jedec. Bold words for the nascent platform then, and Crucial duly obliges by offering modules in 4GB, 8GB or 16GB capacities, with the user free to pick the number suited to a particular setup. For desktop Ryzen running in a dual-channel configuration that's two (or four) sticks of your choice. At the time of writing, there are 27 offerings, though the largest-capacity pack tops out at a speed of 3,200MHz. With that in mind, we asked Crucial to send in two of its largest Elite modules comprising a 32GB (2x16GB) pack retailing for £335. That may sound like a heck of a lot for system memory alone, but recent price hikes mean that you'll pay at least £275 for a similar kit from other manufacturers - RAM, right now, ain't cheap. There has been a subtle cosmetic redesign for the modules. The Elite branding is moved over to the left whilst the Crucial name has been taken off altogether. Unlike most, Crucial keeps the sticker information discrete and simple. Our sample ships at the aforementioned 3,200MHz frequency and 16-18-18 latencies, representing middle-of-the-road timings for this speed. A screwed-on top section can be removed if the modules' 40mm height fouls large coolers, and doing so brings the height down to 32mm, or roughly the same as the smaller Sport. An integrated temperature sensor is read by Crucial's M.O.D utility providing real-time information on heat and, if compatible, LEDs on the Ballistix Tactical sticks. The chunky top makes it easier to push and pull the modules into the sometimes tight spaces inside small chassis. The metal heatspreader is an aesthetically acquired taste, but what can't be argued with is the bulletproof build quality throughout. These are some of the best-built modules on the market. Shipping with the usual lifetime warranty associated with Crucial, let's test them out on an AMD Ryzen 7 1800X platform.